Phase 1: Conduct Market Research. This involves reviewing the competitive landscape to see what other products are in the marketplace, as well as the types of new products that competitors say they are about to release into the market. This also involves a review of which customers may buy future products, what needs they have, and what prices they are likely to pay for selected features on these products. Further, always determine the size of the market in which the new products are to be released, and the amount of market share that can likely be obtained. This gives a company the general outlines of a revenue plan, in terms of the probable number of units that can be sold and the price at which they would sell. Phase 2: Determine Margin and Cost Feasibility. This involves clarifying what customers want for product features, based on the information gathered in the first step, and translating this into a preliminary set of product features that will go into the anticipated product design. Then determine a price point, again based on the preceding market research, at which the product is likely to sell. Then determine the standard margin to be applied to the product (which is commonly based on the corporate cost of capital, plus an additional percentage), which results in a cost figure that the product cannot exceed. Finally, conduct a preliminary review of anticipated product costs to see if the product design is in the cost ballpark. If not, cancel the design project as being unfeasible. Phase 3: Meet Margin Targets through Design Improvements. 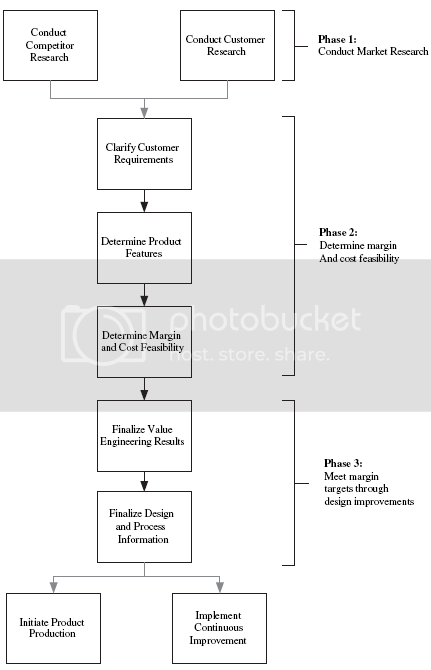 This involves the completion of all value engineering needed to drive down the product’s cost to the level at which the target price and margin can be attained, as well as confirming the viability of the material and process costs with suppliers and other parts of the company that are impacted by these design decisions. The design is then finalized, and the resulting bill of materials is sent to the purchasing staff for procurement, while the industrial engineering staff proceeds with the installation of all required changes to the production facility that are needed to implement lower-cost production processes. Phase 4: Implement Continuous Improvement. Can we eliminate functions from the production process? This involves a detailed review of the entire manufacturing process to see whether there are any steps, such as interim quality reviews, that add no value to the product. By eliminating them it is possible to take their associated direct or overhead costs out of the product cost. However, these functions were originally put in for a reason, so the engineering team must be careful to develop workaround steps that eliminate the need for the original functions. Can we eliminate some durability or reliability? It is quite possible to design an excessive degree of sturdiness into a product. For example, a vacuum cleaner can be designed to withstand a one-ton impact, whereas there is only the most vanishing chance that such an impact will ever occur; designing it to withstand an impact of 100 pounds may account for 99.999 percent of all probable impacts, while also eliminating a great deal of structural materials from the design. However, this concept can be taken too far, resulting in a visible reduction in durability or reliability, so any designs that have had their structural integrity reduced must be thoroughly tested to ensure that they meet all design standards. Can we minimize the design? This involves the creation of a design that uses fewer parts or has fewer features. This approach is based on the assumption that a minimal design is easier to manufacture and assemble. Also, with fewer parts to purchase, there is less procurement overhead associated with the product. However, reducing a product to extremes, perhaps from dozens of components to just a few molded or prefabricated parts, can result in excessively high costs for those few remaining parts, since they may be so complex or custom-made in nature that it would be less expensive to settle for a few extra standard parts that are more easily and cheaply obtained. Can we design the product better for the manufacturing process? Also known as design for manufacture and assembly (DFMA), this involves the creation of a product design that can be created only in a specific manner. For example, a toner cartridge for a laser printer is designed so that it can be successfully inserted into the printer only when the correct sides of the cartridge are correctly aligned with the printer opening; all other attempts to insert the cartridge will fail. When used for the assembly of an entire product, this approach ensures that a product will not be incorrectly manufactured or assembled, which would otherwise call for a costly disassembly, or (even worse) product recalls from customers who have already received defective goods. Can we substitute parts? This approach encourages the search for less expensive components or materials that can replace more expensive parts that are currently used in a product design. This is an increasingly valid approach, since new materials are being developed every year. However, sometimes the use of a different material will impact the types of materials that can be used elsewhere in a product, which may result in cost increases in those other areas, for a net increase in costs. Thus, any parts substitution must be accompanied by a review of related changes elsewhere in the design. This step is also known as component parts analysis, which involves one extra activity—that of tracking the intentions of suppliers to continue producing parts in the future; if not, the affected parts must be eliminated from the product design. Can we combine steps? A detailed review of all processes associated with a product will sometimes reveal that some steps can be consolidated, which may mean that one is eliminated (as noted earlier), or that steps can be combined with one person, rather than having people in widely disparate parts of the production process perform them. This is also known as process centering. By combining steps in this manner, it is possible to eliminate some of the transfer and queue time from the production process, which in turn also reduces the chance that parts will be damaged during those transfers. Is there a better way? Though this step sounds awfully vague, it really strikes at the core of the cost-reduction issue—the other value engineering steps previously noted are ones that focus on incremental improvements to the existing design or production process, whereas this one is a more general attempt to start from scratch and build a new product or process that is not based in any way on preexisting ideas. Improvements resulting from this step tend to have the largest favorable impact on cost reductions, but also can be the most difficult for the organization to adopt, especially if it has used other designs or systems for the production of earlier models. Another approach to value engineering is to call upon the services of the company’s suppliers to assist in the cost-reduction effort. These organizations are particularly suited to the contribution of information concerning enhanced types of technology or materials, since they may specialize in such areas that a company has no information about. They may have also conducted extensive value engineering for the components that they manufacture, resulting in advanced designs that a company may be able to incorporate into its new products. Suppliers may have also redesigned their production processes, or can be assisted by a company’s engineers to do so, resulting in cost reductions or reduced production waste that can be translated into lower component costs for a company. A mix of all the value engineering steps noted above must be applied to each product design to ensure that the maximum permissible cost will be safely reached. Also, even if a minimal amount of value engineering is needed to reach a cost goal, one should conduct the full range of value engineering analysis anyway, since this can result in further cost reductions that will either improve the margin of the product or allow management the option to reduce the product’s price, thereby causing havoc for competitors who sell higher-priced products.